What to Wear to the Gym: Workout Clothes Perfect for Warm Weather | Gina Miller's Blog - A working mom's blog about fitness, travel, handbags & beauty. With Memorial Day weekend approaching, the unofficial kickoff of Summer is upon us. If you're a gym lover, it's time to cool off your workout wardrobe with lighter fabrics that will encourage you to keep going rather than suffocate you in the heat. Nordstrom is holding it's Half-Yearly sale and has a number of quality pieces that are perfect for warm weather. Nodstrom also offers maternity and plus-size women's activewear. Nike Elastika Dry-FIT Tank - $22.49 right now! I love tank tops featuring the exposed built-in bra you're seeing everywhere. These are incredibly comfortable and perfect for yoga, pilates, barre classes, cycling or skating. 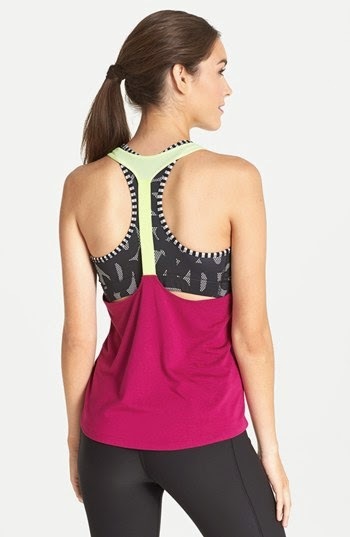 This Nike Elastika Dry-FIT Tank is on sale for $22.49 and will last a while. It also comes in black/yellow and heather grey/peach (only $20.10!) color combinations. These Asics Pure Capris are a good workout pant to wear to pair with these tops. This Zella Strappy Racerback Tank isn't on sale but it's a great top for barre classes, pilates, yoga or walking. In addition to gorgeous pink, it comes in blue, coral and purple. The top is perfect to pair with Zella's Live In Slim Fit Capri Leggings in universal black. Target has a fabulous selection of exercise gear from C9 by Champion that's quite stylish. This C9 by Champion Fit and Flare tank comes in a range of colors and also sports that on-trend built-in bra. C9 by Champion Open Back Layering Top only $19.99! I adore this C9 by Champion Open Back Layering Top. It comes in gorgeous Spring/Summer colors, as well. Shorts are a perfect option for Spring and Target has a great selection of them. These woven running shorts are stylish and also come in black and blue. Don't forget some of the accessories: shoes, ponytail holders or socks. Toe socks are good if you're a barre or pilates fan. For more "what to wear to the gym" inspiration, please check out my Pinterest board.